In a small mall on the way to the beach off NJ Parkway, Point Pleasant’s FRYE BREWING COMPANY opened June ’17. 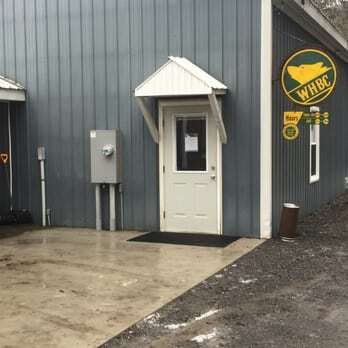 The familial entrepreneurial product of Colleen and Mike Frye, this inconspicuously small microbrewery serves its community well. At the glass entrance, the Frye logo and a Point Pleasant emblem welcome customers to the cement-floored one-room space. Street lights adorn the right side serving station (spotlighting a poured concrete bar top and rusty corrugated steel siding) and brew tanks stake the rear. Frye’s three white picnic tables, six high boy stools and low-ceilinged exposed pipes provide spare detail. Before heading out after my one-hour April ’19 visit, I sampled a half-dozen Frye faves, including four dark ales, one IPA and an Irish Red. Enigmatic Irish Red Ale, Irish Blood Sweat & Tears, let sea-salted blood orange tartness drift off into dewy Scotch-licked beechwood smoke, picking up roasted tobacco crisping and light éclair creaming in a weirdly compelling way. Named for Elon Musk’s rocket launch, vibrant India Pale Ale, Falcon Heavy, loaded creamy pale malt sugaring upon juicy grapefruit, orange and tangerine tanginess and earthen rhubarb-celery snips. Black-malted Irish Stout, The Dark, reinforced its dark chocolate and dried cocoa bittering with musty hop-charred nuttiness, sweetening at the dark mocha molasses finish. A few nifty Dark offshoots also took hold. Coffee bean-engaged full body, Coffee In The Dark, placed its dark-roast mocha muck above oilier hop charred nuttiness than the original version. Perhaps the best Dark ale, coconut toasting sweetened milk-sugared dessert treat, Coconut In The Dark, leaving brown chocolate and toffee sugaring on the back of the tongue. Complexities abounded for creamily fudged barrel-aged surefire, Bonfire Imperial Brown Ale. Aged on rum-soaked cherrywood, its dried-fruited black cherry, burgundy and bourbon tones surged towards the oats-sugared fudged mocha surface, picking up latent anise spicing. 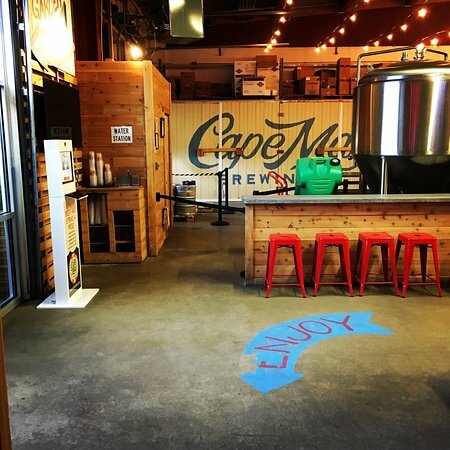 Going all out to be the most vibrant spot on Jersey Shore’s highly active party capitol, Wildwood, MUD HEN BREWING COMPANY takes up an expansive taupe-hued Mediterranean-styled lot about a mile away from the beach. 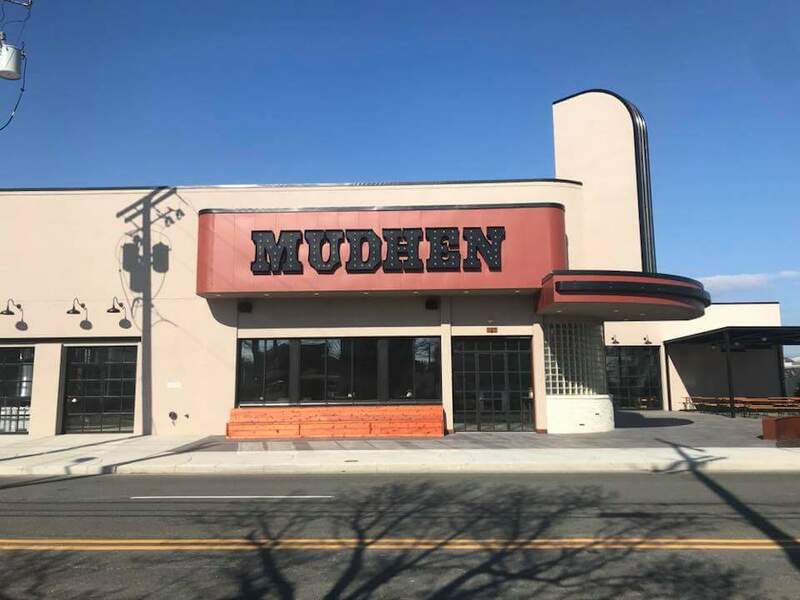 Open during 2017, its enormous illuminated Mud Hen signs invite beachcombers of every stripe to join in on the fun. A multifarious space including a gray slate-floored main space, garage-doored café-styled barroom and large partially covered side patio, its rounded entrance overhang is reminiscent of a grandiose movie theatre. The obsidian Cathedral-ceilinged main area includes a 30-seat slate-topped bar along the rustic brick wall dividing its massive windowed silver brew tank display. A ten-tabled loft area overlooks a barrage of industrial tables and chairs. My wife and I (and dog Roscoe) get seated in the sun-lit patio for early dinner this sunny Saturday afternoon, April ’19. The pub fare’s solid and the specials included my fab veal dish. Lemony herbal ginger enlivened tart banana bubblegum expectancy of Holly Beach Wheat, leaving mild orange-peeled coriander spicing upon its supple white wheat spine. Soothingly dried-fruited moderation, Wise Hen Bock let raisin, fig and prune illusions soak into its brown-sugared banana breading and toasted caramel malts. Dewy peat-smoked Scotch ale, Wee Heavy Wilson, brought seared beechwood influence to caramelized pale malts in fine fashion. Dark-roast black chocolate consumed nutty coffee-smeared full body, Capt. Doug’s Porter. Creamily frothed Primary Cut – Bakers Double IPA put its citric-pined medium body on nitro, letting its lingered grapefruit peel bittering and tangy orange follow-thru gain a sweet vanilla-dipped caramelized pale malt tranquility to contrast its phenol hop resin. Did miss out on flagship 1883 IPA, though. Worthy Cascade-hopped flagship offering, Cape May IPA, provided floral sugar-spiced grapefruit and orange peel tanginess for lightly pungent herbal grassed hop musk, leaving tertiary peach, pineapple and mango juicing on its sunny citrus parade. Not as stylishly rich or resilient, yet totally accessible, R.A.D. 008 Hazy IPA brought easygoing grapefruit sunshine and zesty mandarin orange mist to mild grassy hop astringency above sugary pale malts. Another IPA, Catch The Drift, lacked the expected haze of a New England version, but its floral citrus alacrity, lemony banana tartness and herbal spiced niceties spread goodness all around. Creamily viscous beige yellow-hazed New England-styled IPA, Krusty’s Partially Gelatinized Gum-Based Beverage, gathered lactic yogurt milk souring for lemon-dropped orange juicing and grapefruit sugaring, combining zesty citric-pined Azacca, Idaho 7 and Cashmere hop varieties. Upping the citric hop quotient for its molasses-sapped dried fruiting, Sawyer Swap Barleywine left black grape, dark cherry and green raisin illusions upon tobacco-roasted dewy peat. Stylishly subtle Devils Reach Belgian Strong Ale coalesced lemon-soured pineapple tartness and delicate orange-bruised sweetness to mild fennel-spiced white peppering and herbal barnyard leathering. Sour red wine-barreled brown ale, Lady In Red 10, used its musky black currant-spiced dry plum adjunct to advance its mildly acidic purple grape esters, oaken vanilla tartness and vinous Flanders Red-like cherry respite. Dark-roast coffee, black chocolate and charred walnut blackened Cape May Nitro Stout, a soft-tongued smoothie that compares favorably to Honey Porter Nitro, where raw-honeyed dark cocoa picked up blackstrap molasses bittering and herbal Hallertau hop snips. Coffee-stained Last Hurrah Imperial Stout left dark chocolate malting upon recessive hazelnut, walnut and Brazil nut earthiness. 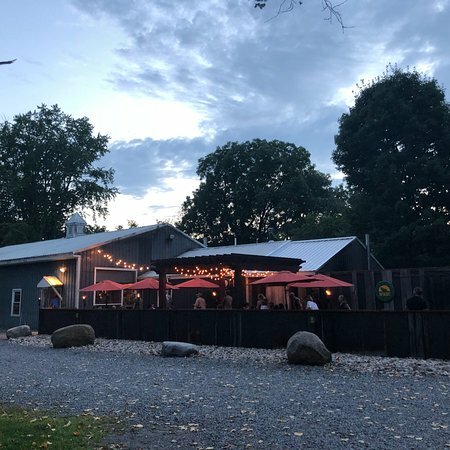 Proud to be New Jersey’s first non-profit microbrewery, humble barn-housed COLD SPRING BREWERY brings an Old Wild West feel to Cape May. 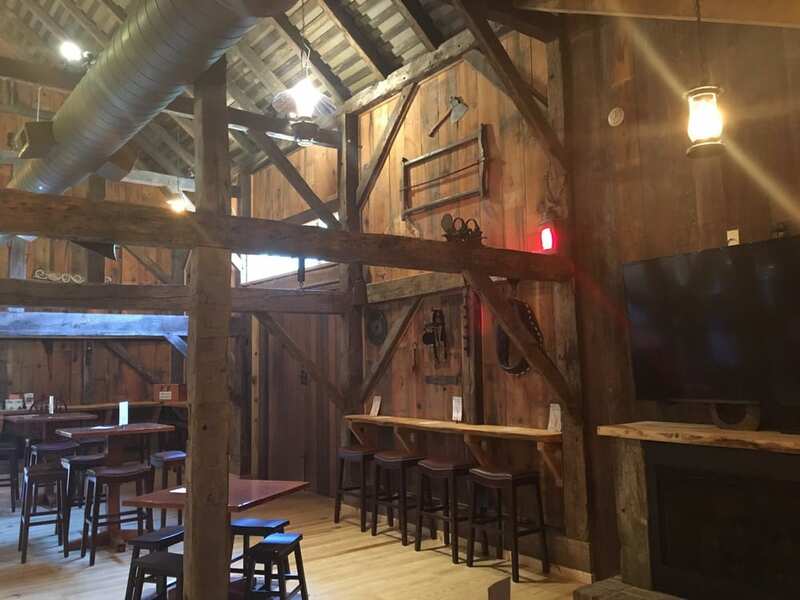 Part of the historic Cold Spring Village (museum, restaurant, creamery), this wood framed ranch featured antique horse harnesses, ancient pistols and large exposed pipes along its columned A-frame interior, providing quaint rusticity for the family-styled village. Leather-cushioned wood stools and seats get serviced by the tree-barked L-shaped serving station. Six draught lines offer predictably easygoing fare from the rear nano system. Near the side door, there’s a bench-saddled hearth area with overhead TV and several cozy wall booths. 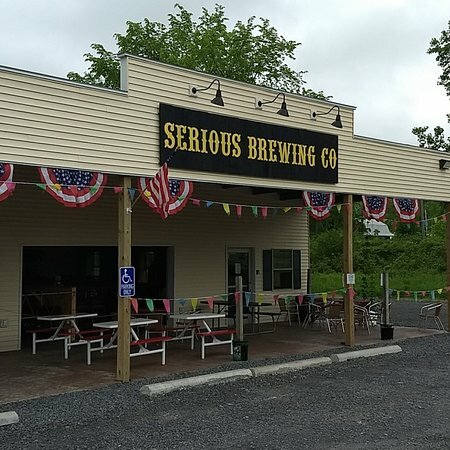 My wife and I grab a few seats at the large fenced-in outdoor area where we consume five commonplace brews that’ll definitely please softer blue collar palates. For openers, grassy pine hops dabbled with lightly embittered grapefruit-peeled orange rind subtleties for dry-bodied moderation, Ishmael Pale Ale. Tea-like Finley Forge IPA stayed dry as apple-skinned citrus tartness gained dewy pale malt sweetness to contrast its phenol hop tannins, recalling a more moderate Brit-styled IPA. Mild Poor Sailors Sour Ale brought subtle lactic acidity to tart cider piquancy and vinegary green grape esters with efficient results. Tart citric-quince-spiced Cold Spring Red Ale retained a crisp barley roast but little else. Delicately creamed Dennisville Inn Porter underscored its delightful cocoa-chocolate influence and hazelnut-glazed pecan sweetness with ashen walnut bittering.